I have done some instruction work with Canadian PGA Tour Professional Corey Jones. Corey recently experienced a breakthrough in his putting by making some simple set up adjustments that caused his stroke to improve significantly. 1. Swing the putter in a downward motion therefore de-lofting the putter and causing the ball to bounce instead of roll of the putter face. Both these strokes will result in poor strokes and produce many missed putts. To correct this problem with Corey we simply adjusted his set up position, which allowed him to flatten out his stroke and begin rolling the ball more purely. Correction: Center the weight so you feel balanced over the ball and not bearing too much weight over either foot. Allow the head to feel positioned more to the backside of the ball than the front of the ball. This adjustment will free up the arms and allow them to swing the putter back lower keeping the bottom of the putter on the ground longer. The forward stroke will then return to the ball along the same low path producing a true roll on the ball. You will eliminate the hopping or bouncing of the ball off the putter face and generate more topspin. As a result the ball will roll truer and stay on line longer. The feet, knees, hips, forearms and shoulders should remain parallel to the target line. The eyes should be over the ball and weight towards the balls of the feet. Your arms should feel as if they are hanging freely from the shoulders and the grip in the palm of your hands. The lower body should be rock solid and your head still with the pace of the stroke a result from the movement made by the shoulders and arms. Keeping the putter low on the back and forward motion of the stroke takes advantage of the proper loft on the putter and allows the putter face to strike the ball on the equator line. 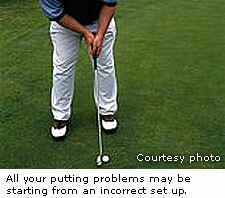 Any putter face angle change causes the putter to strike the ball below or above its equator, resulting in a poorly struck putt. If your putting is giving you trouble try this set up adjustment and see if you don't start rolling the ball better and subsequently making more putts. Watch for Cory Jones on the Canadian Tour this summer and notice how well he putts!